The NBA has named the eight competitors who will take part in the 3-Point Shootout at 2017 NBA All-Star Weekend. The NBA named the eight players who will compete in the 2017 3-Point Shootout. The competition will be one of the highlights during All-Star Weekend in New Orleans. The NBA made the announcement on TNT before the Thursday night game. Kyle Lowry, Kyrie Irving and Kemba Walker will represent the Eastern Conference. Klay Thompson, Eric Gordon, C.J. McCollum, Wesley Matthews and Nick Young are representing the Western Conference. Lowry was named to his third straight All-Star game this year. 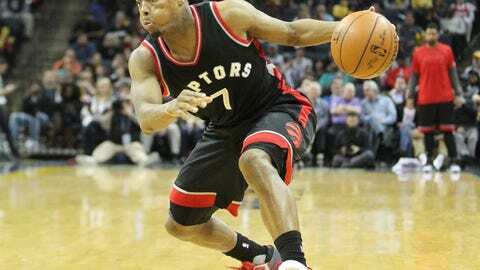 The Toronto Raptors point guard is shooting 42.7 percent from three this season. For his career, Lowry is shooting 36.5 percent from behind the 3-point line. After hitting the championship-clinching shot in the 2016 NBA Finals, Kyrie Irving is competing. Irving is shooting 39.5 percent from three this year. Irving’s career average is 38 percent from deep. Kemba Walker has improved his 3-point shooting nearly every year of his career. The Charlotte Hornets point guard is shooting a career-high 40.2 percent, but his career average is only 34.5 percent. Klay Thompson will likely be one of the favorites entering the competition. Thompson has connected on 40.3 percent of his 3-point attempts this year. Thompson has made 41.8 percent of his threes in his career and won the contest last year. Eric Gordon played the past five seasons in New Orleans. His season average and career average are nearly identical from three. This season, Gordon is shooting 38.6 percent, and for his career Gordon makes 38.4 percent of his threes. Portland Trail Blazers guard C.J. McCollum has seen his 3-point percentage increase in each of his four NBA seasons. McCollum is shooting 42.1 percent this year. For his career, McCollum is 41.3 percent shooter. Wes Matthews has been a consistent three-point shooter in his career. Matthews is shooting 38.1 percent from three this season and 38.6 percent for his career. Nick Young has never seen a pass he did not shoot. The Los Angeles Lakers guard is shooting a career high 42.4 percent from three this year. The self-proclaimed “Swaggy P” is a career 37.7 percent 3-point shooter.